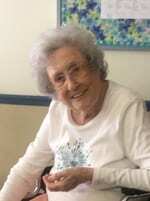 Lucille Powers Buechler, 96, of Loganville, GA passed away Sunday December 16, 2018. Born May 19, 1922 near Mableton, GA to the late James Henry and Hattie Floyd Powers, she attended Mableton Grammar and High School. She was also a graduate of Marsh Business College. Mrs. Buechler retired from Norfolk Southern Railway after 40 years of service. She was preceded in death by her first husband, Joseph M. Turner, Jr.; sister, Ruth Capper; and a brother, James Powers. Surviving are her husband, William E. Buechler, Jr.; sons and daughters in law, Joseph M., III and Sharon Turner, West Springfield, MA, James F. and Carole Turner, Dawsonville; grandchildren, Wendy and Steve Browning, Carla and Andrew Tacke, Andrew S. and Rachel Turner, Christopher J. and Jennifer Turner; and 8 great grandchildren. Funeral services will be held Thursday December 27, 2018 at 3 o’clock at Bearden Funeral Home Chapel. Rev. Brody Hughes will officiate. Interment will follow in the Juno Baptist Church Cemetery. The family will receive friends on Thursday December 27 from 1 p.m. until 3 p.m.